Hi friends! I am happy to announce hosting my 1st event this year Bake Fest # 16 at My Cook Book for the month of February. Thanks Vardhini from Cooks Joy to give me this opportunity to host this event. Only vegetarian or vegan recipes please. Eggs are allowed in baking. Usage of logo is appreciated as it helps spread the world. 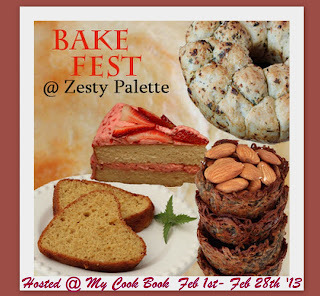 Linking back to my announcement page and to Vardhini's Bake Fest announcement is mandatory. If sending an old entry, it needs to be re-published with both links. Sure I am sending some entries!!!! happy hosting!! Lovely event..have linked my entry.. Tried to include 2 of my entries and they are no appearing... One is Whole Wheat Bread and another is Stuffed Masala Bun. Please let me know..
Luvly event, will surely participate. Glad to follow you. All the best!